As the title suggests, The Lion in Winter is a dramatisation of Henry's mid-life (or, as it would turn out, late-life) crisis, his attempt to pick the right heir from amongst three sons (including the prince who would later be known as Richard the Lionheart) and his banter, alternately acerbic and tender, with his ex-wife. Also thrown into this right regal soap opera is Eleanor's stepson, the petulant Prince Philip of France. While turkeys wait to be spread out for the banquet table, these royals feed on each other – conniving, recriminating, digging up past grievances. There isn't a weak link in the performances. Hepburn, who won the third of her record four Oscars for this role, perfectly mixes poise and vulnerability (her real-life struggle with Parkinson's Disease adds to the poignancy of her performance as a woman who has been cut off from her family for too long) and Peter O'Toole is an astonishingly energetic Henry (the scene where he baits Richard and then makes as if to bring his sword down on his son's neck is a heart-stopper, even though you know all this is High Farce). Anthony Hopkins, more than 20 years before achieving fava-bean-and-chianti stardom in Silence of the Lambs, makes a fine Richard, and the callow, much-too-young Timothy Dalton is perfectly cast as the callow, much-too-young Philip. Henry: The day those stout hearts band together is the day that pigs get wings. Eleanor: There'll be pork in the treetops come morning. Henry: You're like a democratic drawbridge: going down for everybody. Eleanor: At my age there's not much traffic anymore. But it's easy to guess the overall effect he was reaching for. He was trying to de-mythologise an important period; to rescue it from the sterility of school textbooks and bring it to joyous, rambunctious life, linking the political and the personal in a way that modern audiences could relate to. It works. 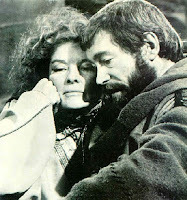 The Lion in Winter is a cheeky thumb-wag in the face of any delusions we might have about the dignity of royal houses (admittedly, recent events have made it hard to sustain those delusions anyhow) and the grandeur and purposefulness we associate with key historical events. It reminds us that much of history has been built on individual hubris, quirks and whimsies, and that the fates of nations might be decided by a wrong word spoken here, a telling glance there. As one character says, frat-boy style, to another, "If you're a prince, there's hope for every ape in Africa." sigh. another one of those films that i lost in the great vhs tragedy. i loved this film when i saw it. not sure how i'd react now. you know another film that's inextricably linked in my mind with this lion in winter, becket thing? a man for all seasons. Brilliant stuff, especially in 600 words. John: He has a knife! Eleanor: Of course he has a knife. We all have knives. It's 1183 and we're barbarians. It's an early model, I think, of the now-ubiquitous family dysfunction movie, writ incredibly large on the stage of international politics. If you want an entirely different perspective on E of A, try and read "Back Home at the O.r.g.y." by Ted Mark. You could also try "A proud taste for scarlet and Miniver" by E.L.Konigsburg. Absolutely charming and it has beautiful sketches in the 12 century style of zero perspective. The Lion in Winter has always been one of my favorite movies. Stellar performances from the entire cast, Brilliant writing, and ultimately the humanity of all the characters makes me miss my own family. Trouble is that when I read a piece about Hepburn and it contains factual errors I bristle. her life was an open book. She lead it courageously and honestly. So when someone makes an elementary research mistake like mentioning Parkinson's Disease which she did not have I find the rest of what they have to say a nit less than interesting. The following is a quote from her autobiography. "Now to squash a rumor. No, I don't have Parkinson's. I inherited my shaking head from my grandfather Hepburn. I discovered that whisky helps stop the shaking. Problem is, if you're not careful, it stops the rest of you too. My head just shakes, but I promise you, it ain't gonna fall off!" That took me about 30 seconds to find on the internet. Why do you suppose that someone writing a piece about her wouldn't have bothered to take that much time to learn the facts? the new me: thanks for the biggest laugh I've had in a few years. The things you can find in 30 seconds on the Internet!